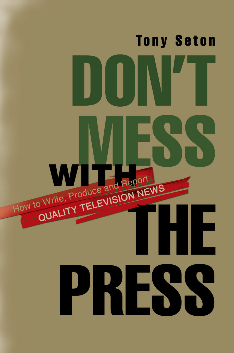 "Don't Mess with the Press"
Don't Mess with the Press is a primer on quality television news, written by veteran award-winning broadcast journalist Tony Seton. The book explains the three basic functions of television news: how to cover a story, assemble a report, and produce a newscast. It also addresses the business of how to market quality television news. Don't Mess with the Press offers detailed information on the workings of television news from the initiation of the story coverage by the assignment desk through the production of a broadcast. Along with thorough instruction in all phases of news-gathering and production, the book features useful experience- taught tips on how to most effectively write, produce, and report quality television news. Tony Seton's Don't Mess with the Press is instructive and delightful. Both the beginner who is already on her way and the veteran broadcaster who thinks he has all the answers should read it. It is a must for any journalist interested in more than wardrobe, hairspray and salary. The glossary is worth the price of the book. This is an extraordinarily entertaining book, riddled with anecdotes to tickle the funny-bones of those who have devoted their careers to the fascinating, often thrilling, world of television news. This book is essential reading for the would-be television journalist, told by one who has done it all. Like so much of Tony's work that we so valued at ABC News, this is a tour de force. Anyone who wants to know what the increasingly disreputable TV news business could be ought to read this book, because it’s written by a guy who helped make it what it once was. At some point--often in despair or a heavy sweat--every journalist exclaims: "Why didn't someone tell me that?" Tony Seton's years of experience provide a collection of such moments of enlightenment for aspiring and perspiring broadcasters. For journalism teacher reviews, click it. Don't Mess with the Press is based on a decade of daily hands-on work in television news; I have many years of radio, print, and teaching experience as well. I learned television news from the ground up, starting as a desk assistant (copy boy) on the overnight shift of the ABC Network Television News Assignment Desk in 1970 for $73-a-week. I worked my way up through the ranks to become a full producer. I covered Watergate, six elections, and five space shots, along the way of years of general assignment coverage. I produced Barbara Walters' news interviews, and I pioneered new visual techniques in coverage of business and economics issues. Working in local and network news operations, as well as in public television, I developed a broad knowledge base in all aspects of the editorial production of television news. The observations and instructions in Don't Mess with the Press substantially comprise the how-to of television news. In addition, reinforcing the lessons and making for a more readable book, there is an assembly of illustrative and informing stories about my personal experiences in television news, from my arrest covering Elvis Presley's funeral to an exclusive interview with President Carter at the Economic Summit in Bonn. To see the Table of Contents, click it. To see the Introduction, click it. To see the Preface, click it. To see a Sample Chapter on Reporting, click it. To see a Story on Watergate, click it. To see Discussion Points and Practices for each chapter, click it. To see the Appendix, click it. To see the Errata, click it. To see Tony Seton's bio, click it.